I usually have a bottle of a Speyside or Highland in my rather cramped liquor cabinet for those gentler souls who prefer a whisky that’s milder than my usual suspects—all Island malts. I’ve always been a guy who liked BBQ, spicy Thai and Szechuan, hoppy beers–you get the idea. I go for big taste. So when I started engaging with whisky, I blew quickly through the Glenlivet and Glenfiddich 12-year offerings. They did not exactly turn on my taste buds, and for the cost ($50-ish a bottle where I live), that just was not going to cut it. My buds gravitated to the bigger, smokier and peatier tastes of the Island malts. 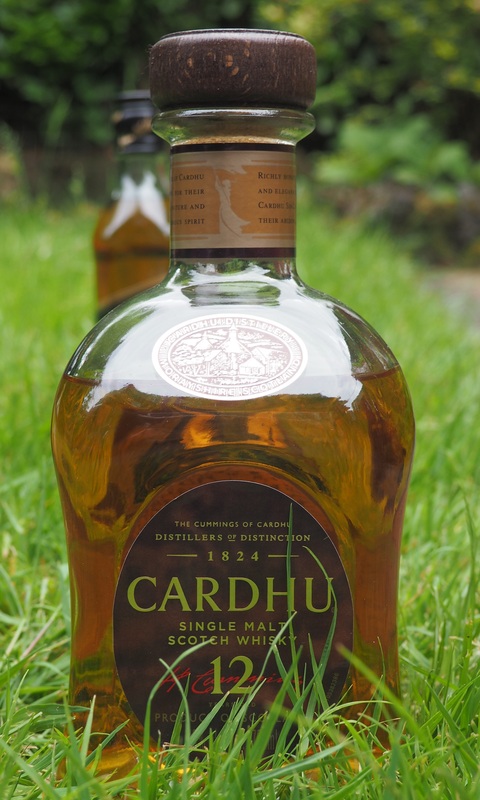 Cardhu – you can imagine a lush grassy field when tasting this whisky. However, I recognize quality and consider The Macallan 12 a benchmark for well-made whisky. That’s a Speysider I keep around for guests who recoil at my Laphroaig and Ardbeg. When I’m in a calm mood I like a dram of the Mac and when I received a bottle of the Cardhu as a birthday gift this year, I was well impressed. This is crass of me to admit, but being a bit obsessed with cataloging my experiences, I checked out the price. About $42 locally, vs. mid $50 range for Macallan. A nice surprise. On the nose, Cardhu shows its origins: presumably the spot for the distillery was chosen for the influence of a peat bog on the water supply. The effect is subtle though, and its fruitier notes shine through on the nose and palate. Stacked against Macallan, it is crisper and fresher smelling, with less honey–like comparing a Granny Smith apple to a Honeycrisp. The finish is as clean as Macallan, no stinging alcohol here. The Cardhu goes down well, retaining its crispness and finishing up with a character that’s missing from its more well-known (and expensive) neighbors, the famous ‘Glens’. Where The Macallan is distinctly woody in its finish, Cardhu softer and definitely more coffee than oak, though there are some tannins lingering on the back of the tongue. The color is lighter, and I’m fairly certain the Macallan’s is honest, due to their sherry finish, but I don’t judge on color. The Cardhu is an unassuming straw color. Just for fun, since I’m preparing a post on the 12 and 18-year expressions, I compared Cardu to a Highland, Glenmorangie. They are too different to compare. I fear I now must keep a Highland in the cabinet with the Speysider and all my beloved Island malts. I’ll report soon, but basically, the Glenmorangie (the most popular scotch in Scotland, presumably), is a lot grainier tasting, almost like an American rye. Cardhu is not toasted with peat, but has a mineral earthiness from the water used in the mash. Given that, it is a Speyside all through: light and a little zingy with fruit notes. Unlike some younger single malts (like Speyburn, an 8 y.o.) it is well-balanced. How does it fare? Nose: Malt, a light, earthy peat, strawberries, green apples. Lively but not harsh. Palate: Strawberries, caramel, apple; a smooth and viscous mouth feel. Finish: Malt, a little turkish delight, drying to coffee and oaky tannins. Bottom line: Damn fine dram for $42. No smoke, but in all-around complexity and finish, punches above its weight. This is going into the rotation as the “at least they won’t be repulsed by this one” collection. This entry was posted in Scotch-single malt, Whisky and tagged Cardhu, Scotch, Whisky. Bookmark the permalink.